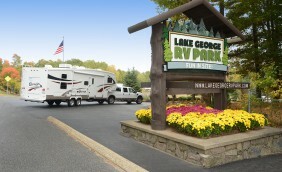 Why celebrate Spring in the Adirondacks at Lake George RV resort? You’ll find luxury accommodations, amenities, and privacy that make this the best time of year to enjoy everything this beautiful region has to offer with our Lake George NY vacation rentals! The spring snows continue to melt in the nearby Adirondack Mountains, giving way to all sorts of activities and adventure opportunities, both indoors and out. From the St. James Spring Fair to the Memorial Day Parade and the annual Elvis Festival, there’s plenty of fun and unique events to enjoy! Call us today at (518) 792-3775 for more information about our park model rentals, to check rates and availability, or make a reservation. Spring is a beautiful time to enjoy the Queen of American Lakes! The air is fresh, the water is high and there is a sense of peace and tranquility that you can best experience twice during the year – Spring and Fall. From the comfort and privacy of your lodging in Lake George, you can take advantage of the area’s many miles of trails to go biking in the Adirondacks, do some spring hiking, or capture the roaring Class IV white water of the Hudson River at the annual Hudson River Whitewater Derby. No matter how much excitement you’re looking for, you will relax and wind down at the end of the day in luxury surrounding to rival that of any Lake George hotels. Spring in Lake George is one of the most beautiful – and romantic – seasons for enjoying everything the area has to offer. Shop major retailers at the nearby Lake George Outlets, enjoy a visit to the renowned Hyde Museum in Glens Falls, or take in a live performance right here at our own French Mountain Playhouse. You will enjoy a wonderful degree of privacy and relaxation with on-site amenities that include our own fitness center, indoor heated pool, and two movie theatres for your enjoyment…amenities you won’t find renting rooms or cabins in Lake George for yourselves or a group of friends. 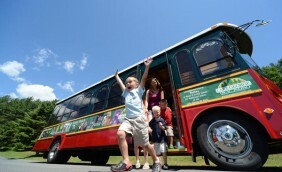 Get a jump on summer and plan a family fun weekend in Lake George NY! Located near Vermont and just a short drive from Saratoga Springs, Albany, and historic Ticonderoga, our Wilderness Lodging in Lake George is perfect for a long weekend or mid-week escape with the whole crew! There’s plenty of things to do…from our on-site arcades, playgrounds, bike trails and swimming pools, to everything that nearby Lake George village and the Adirondacks have to offer. Plan your Lake George resort vacations with us – our comfortable and affordable lodging accommodates a family of six with spacious living areas, bunk beds the kids will love, and all the comforts of home! Call us today at (518) 792-3775 to check rates and availability, make a reservation, or to learn more about our family resort in Lake George! Explore Lake George, New York! Discover convenient Lake George lodging near Vermont at an extraordinary family vacation resort with accommodations that let you enjoy all the comforts of home. Located between the majestic Adirondack Mountains of Upstate New York and the beautiful Green Mountains of Vermont, you can plan a weekend getaway or a full-fledged family vacation! There are activities and attractions for the entire family to enjoy when you stay at our Lake George park model rentals. 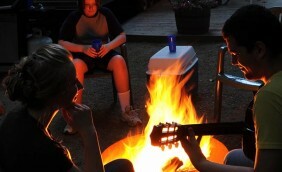 Enjoy an unparalleled choice of on-site amenities and the comfort of a crackling campfire at the end of the day! Lake George hotels are unable to provide the same spacious andprivate wooded setting that our Adirondack lodging units do,with all the comforts of home. Why should you vacation in Lake George if you live in nearby Vermont? Unlike the typical Lake George cabins and cottages, our Wilderness Lodgingoffers space, privacy, and luxury lodging accommodations that will sleep six adults comfortably. Kids love the ‘bunk room’! Our Lake George NY lodging also includes access to all the extensive amenities the Park has to offer: an indoor heated pool, two outdoor heated pools, movie theaters, paddle boats, a stocked fishing pond, tennis, miles of bike trails and live events and entertainment, and much, much more! Shop the major retailers at the nearby Lake George shopping outlets located near our family vacation resort. Lake George Village is just two miles away, offering sightseeing and museums, shopping, dining, entertainment, and nightlife. If you live in Vermont, start planning your Lake George vacation! Discover everything the area has to offer from the comfort and luxury of your private lodging in Lake George! Call us today at (518) 792-3775 to check rates and availability, make a reservation, or request more information about our vacation rentals in Lake George. Vacation rentals at Wilderness Lodging in Lake George are always hopping with new activities, fresh entertainment, and unbeatable amenities. 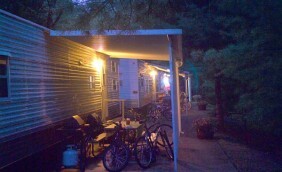 No matter what time of year, lodging in Lake George at the vacation rentals is top notch! Please see what our community has to say about our unprecedented vacation rentals. Book now for prime availability! Lake George, of course! With so many exciting attractions and events that will engage the whole family, Lake George is your one stop, fun-filled, year round vacation destination. 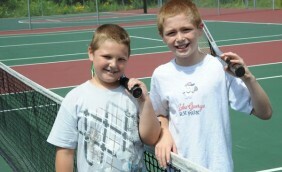 From water parks to mini-golf excursions, the village of Lake George offers something for everyone. Interested in learning about the culture that cascades throughout the region? The Lake George Arts Project, along with the Adirondack Theatre Festival and the Lower Adirondack Regional Arts Council provide educational classes, as well as galleries, shows and workshops to satisfy your creative side. Support your fellow artists and stop by one of the many galleries throughout the Adirondack region to enjoy inspiring, one of a kind pieces. For superb fishing, invigorating hiking trails, challenging bike paths, and fantastic horseback riding trails – Wilderness Lodging in Lake George at the RV Park is your match! See for yourself why Wilderness Lodging is known for being the premier RV and Lake George lodging resort in the Adirondacks! Whatever your style, taste and budget, there is always something in Lake George that will spark your interest. Perfectly situated, the Wilderness Lodging vacation rentals are the hot spot for kicking off your next Lake George vacation. Book now! Why Stay at our Lake George Vacation Rentals? 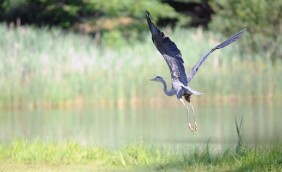 Witness the wonder at our Wilderness Lodging in Lake George! Enjoy five star amenities that you would receive at a hotel in Lake George, private living quarters tailored to your every need, with an abundance of activities geared toward families and groups – Wilderness Lodging is your number one vacation destination in Lake George! Find superb resort facilities all year round. It’s no wonder our Lake George vacation rentals are rated among the best lodging in the Adirondack region. Please join our community and see what the talk is all about! We look forward to making your vacation to the Lake George region unforgettable. 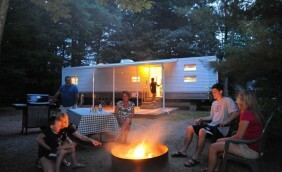 Enjoy the unforgettable experience of camping in Lake George, NY! 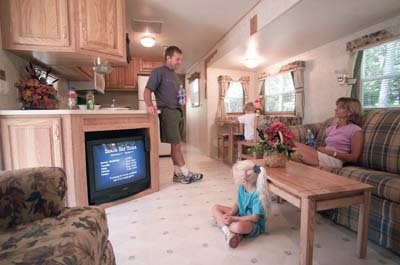 Our RV campsites easily accommodate all sizes and types of RVs from small folding campers to travel trailers, fifth-wheels and the largest and most extravagant motor homes. We have over 400 impeccable pull-through and back-in campsites with 30 and 50 amps, 4-way hookups, water, sewer, and cable available at every site. Each site has a picnic table and fire ring, with FREE WI-FI access. 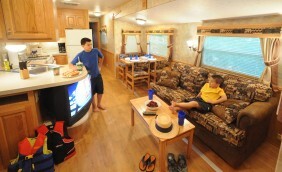 Want to enjoy camping in Lake George, but don’t own an RV? 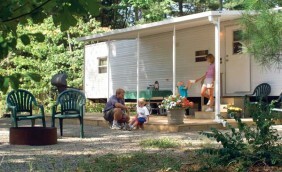 Our 24 deluxe park model rentals will let you experience the outdoors in style. 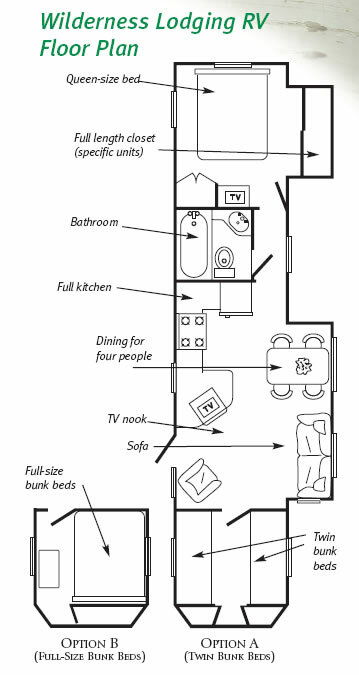 These 40-foot models will comfortably accommodate a family of six, and our numerous on- and off-site amenities and attractions make us the best lodging choice for your Lake George vacation. Select rental units are now pet friendly. 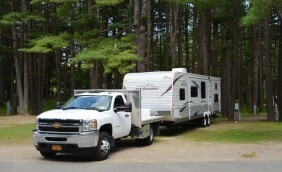 Whether you are bringing your own pop-up or big-rig, or opting for one of our deluxe RV rental units, Lake George RV Park in the popular Adirondack Region can accommodate. 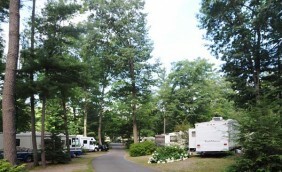 Our RV resort is in a great location, close to all of the fun family attractions and events the area has to offer. 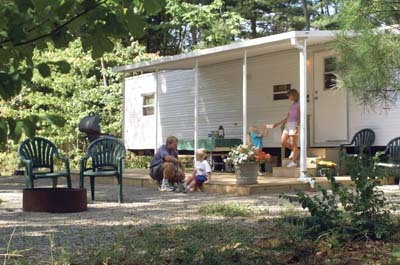 Spend your next vacation at our award-winning RV resort in the beautiful foothills of the Adirondacks! Call us today at (518) 792-3775 to check rates and availability, make a reservation, or request more information on luxury park model rentals.